Thank you so much for joining us at the 5th Annual Run Ocean Isle Beach certified road race! It’s just 5 days away and as we get ready for Saturday 10/27, we’re covering a lot of the frequently asked questions regarding travel, parking, expo/packet pickup, race day plans, after party, etc.. plus lots of quick links to help you have a great race experience. But if you have any questions at all, you can respond to this email directly and we’ll do our best to respond promptly. Now who’s ready to earn that #BigAssMedal? Oh, and have you clicked “LIKE” on our Facebook page yet? If not, please do, just click here. Please know your bib number when you come to packet pickup! It was emailed to you today but if you didn’t receive an email for some reason, you can always look it up here. Or if you registered more than 1 person under your email you’ll need to look it up here as well. You need to know this for packet pickup! 5K RUNNERS CAN NOW RUN THE 1 MILE TOO! With the 5K starting at 7:15 and the 1 Mile not starting until 8:30, you can earn your awesome 5K Pelican medal, then jump in the 1 mile walk/run and earn the cute Narwhal medal! We have limited space so hurry up and sign up online! It’s only $25 and 100% of the profit is donated to local non-profits in the community. KNOW SOMEONE THAT’S MISSING OUT? TELL THEM TO REGISTER EARLY BEFORE IT SELLS OUT! Know some of those “non-runners” but awesome supporters? Get them out here to cheer you on and tell them they will have 10 times the fun if they make a sign! Walkers are welcome too, in fact our 1 Mile proceeds are handed directly over to support some great local non-profits in the area! Each race and area that we run in is unique with restrictions and laws that we must carefully follow. Please help us follow these rules so that we can continue to have a fun family friendly event with a beer garden to follow it! 1) No ID = No Beer – You must bring your ID to packet pickup. Here you will receive an “Over 21” band that you’ll need to wear on race day. 2) It’s a limit of 2 beers or ciders per runner. You will have tear-away tabs on your bib for this. 3) All alcohol must stay within the beer garden area! This will be held at Pelican’s Perch Restaurant parking lot – right next to the finish line. *We’ll have Michelob Ultra, Landshark & Bold Rock Apple Cider to choose from! 4) There is a strict cut-off of 10:30am for serving beer. Please get your beer/cider before that. (10 minute drive) Days Inn off of Hwy 17 in Shallotte, NC is a short drive from the start/finish line and very runner friendly. Be sure to mention you’re coming for the race. (2 minute walk) The Islander Inn & Ocean Isle Inn are both on the island just down from the start/finish. You can wake up a little later and not have to worry about parking at all. We will host a packet pickup on Friday October 26th from 2pm – 7pm at Brick Landing Clubhouse located HERE (1882 Goose Creek Rd SW, Ocean Isle Beach, NC 28469). We are asking ALL packets to be picked up here on Friday night. If you can’t make it, it’s ok to pick up race day morning – but please come extra early! (1) The bridge will be limited to one lane for runners starting at 6:45 so ALL runners in the 5K or half marathon should be on the island to avoid traffic delays and missing the start. (2) This is partially an open course so it’s important to stay to the side when not in coned sections. PARKING: There are several places to park around the start/finish line. You will want to drive over the bridge and onto the island. Click here for directions or use (11 Causeway Dr. Ocean Isle Beach, NC 28469) Here we will have a volunteer directing you to the Pier parking lot and large grass lots we’ve been given permission to use. Early birds get some really good parking spots! (4) Make an AWESOME sign! especially those non-runners! CLICK HERE for directions or use (11 Causeway Dr. Ocean Isle Beach, NC 28469) for directions to the start/finish line. – To ensure runner safety, as we pick up cones and police assistance is relieved, we will ask for runners still on the road to move to the sidewalk at this point. If you don’t want to leave the course at this point, that is fine but understand water stops and course support is pulled at this time. 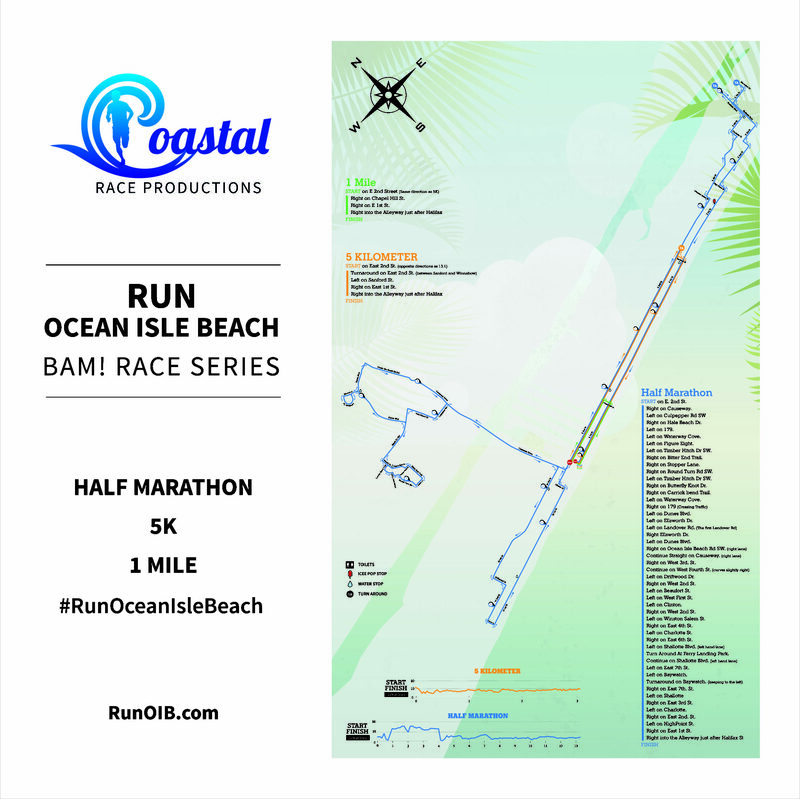 *If you go to the website: http://runoib.com you will see a large course map and a printable PDF for all of the routes. We will also have a large 8′ map for you to look at during packet pickup and by the start line on race day. 2) When running where it hasn’t been coned off, please run where signs and volunteers direct you, stay to the side of the road and be courteous of drivers and residents. We do this every race and it’s a fun way to share pictures and have a chance to run for free! Use #RunOIB to share with your friends you’re running in this race. Take pictures of your practice runs, during the race and at the after party on Facebook, Twitter & Instagram. We’ll be sharing your pics on our website and facebook page. Be sure to tag us or post to our page so that we see your pictures! 1 Lucky winner from the photos uploaded will win a FREE entry into any of our races – your choice! You can start sharing pictures NOW! Can I swap tshirt sizes? Yes, after the 5K starts on Saturday, based on availability. Strollers Allowed? Strollers are allowed on all courses. Please be careful and watch your surroundings! What’s the plan for inclement weather? Come ‘on, let’s not even mention it. But this is a rain or shine event. See our General FAQ’s Page and our Run Ocean Isle Beach Race Website for more information and again, please don’t hesitate to email us and we’ll do our best to respond promptly.